With organizations moving to an extensively mobile-only workforce, corporate apps now act as the nucleus to such organizations. It becomes the foremost task of the IT admins to ensure all the requisite corporate apps are present on the device and are running the latest version, by constantly updating them. MDM lets you take complete control of app management - installation, deletion, update and license management. You can manage both Store apps as well as Enerprise apps over-the-air(OTA), using MDM. The first step towards app management in MDM, is to build an App Repository. As the name suggests, App Repository contains both Store and enterprise app, to be distributed to the devices. Once done, the apps are ready for distribution. Once distributed, app installation is initiated through the Store, in case of Store app and in case of enterprise apps, the device contacts MDM to initiate installtion. Once the installation is initiated, the installation status is updated in near-real time on MDM. App updates is similar to app installation, while app deletion is even simpler. Know more app deletion from devices here and from groups here. Another easier alternative to removal of apps is moving apps to Trash. 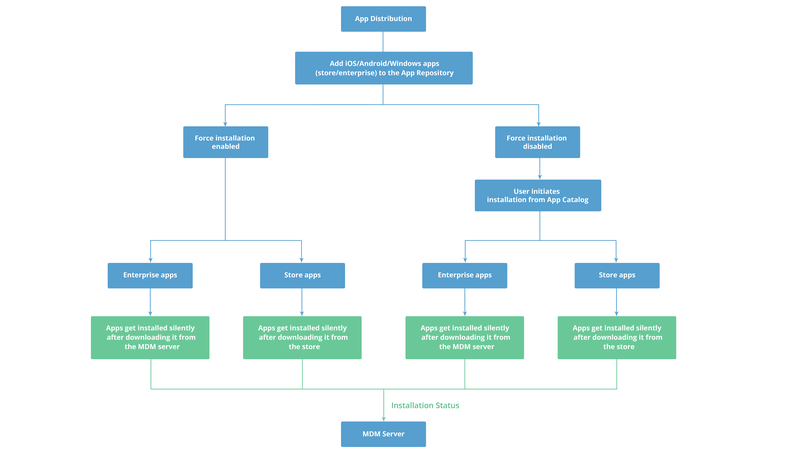 You can understand app installation in MDM using the flow diagram given below. You can add Android apps in bulk to App Repository, as explained here and iOS apps in bulk, as explained here. You can also install Android apps silently without any user intervention as explained here. Silent installation of iOS apps can be done as explained here. Managing apps is more complex, since overwhelming number of apps are discovered in the enterprise everyday. You will have to manage all the apps, which is quite a challenging task. You can simplify app management by grouping apps based on installation type. You can choose the type of apps, which needs to be managed from here : Mobile Device Manager Console -> Inventory -> Apps -> Settings ->Type of Apps to be managed. You can choose to ignore the apps that are pre-installed in the device and the apps that are distributed through MDM. By ignoring these two types of apps, you will be able to focus on the apps that are installed by the users. Only the apps that you have chosen will be displayed on the views of the Mobile Device Manager console, expect for blacklisted views. Even if you ignore to manage pre-installed apps, it will still be displayed, if any such app has been blacklisted. For example: You have blacklisted the app "twitter", this app has been discovered on few devices as pre-installed app, then this app will be listed on all blacklisted views. Managing apps not only involves distributing the apps to devices, it also includes ensuring the apps remain up to date with all the required updates installed. Mobile Device Manager Plus allows admin to manage these app updates from a single view. Under Device Mgmt, click on App Repository. All the apps that were added to the repository, will be listed out in this view. Click on the App name to view more granular details about the app. It includes details like app version, the devices with the apps, details about the app updates and license details. In addition to these details, we can also view the deployment status of the app to devices by clicking on App Distribution Status. Keeping the apps up to date can be a tedious task since the administrator needs to ensure that the available updates are compliant with the organization's policies and all the critical updates are completed on the devices. MDM server contacts the store everyday to check if new updates for apps have been released. If a new update is available, it will be notified on the MDM server as well. In the case of enterprise apps, the apps have to be updated by the admin on the MDM server. The apps are purchased from the Apple Business Manager Portal. The apps should be distributed to the devices with the option 'without Apple ID' option enabled. Click the App name under the App Repository tab. Once an update is available for the app, an Update All button will appear below Yet to Update Apps. Click on the button to distribute the update to all the devices. Enable the checkbox Add to App Catalog if you want to user to install the update from the App Catalog. If you want to silently complete the app installation, enable Install Updates Automatically . Click on Update App to complete the app update. Under Device Mgmt , click on Groups & Devices. Click on the Groups or Devices tab. Select the required Group or Device name. It will list out all the apps which are available for the Group/Device. Select the app to be updated and click on Update App. When you want to delete app(s) associated with devices/groups, you can simply move the apps to Trash. Moving apps to Trash, ensures the apps are automatically disassociated from the devices/groups, instead of doing it manually. These apps are automatically deleted after 90 days. The apps can also be deleted permanently or restored manually from Trash by the user. However, the restored apps don't get automatically distributed to the previously associated groups/devices and need to be distributed again. On the MDM server, navigate to Device Mgmt and select App Repository, from the left pane. You can view the list of apps added to the App Repository. Click on the Move to Trash button and the apps are moved to Trash. The apps can be viewed by clicking on . The profiles can be deleted or restored from there. 1.Moving Kiosk-provisioned apps to Trash, results in the removal of the associated Kiosk profile from the devices. Assuming you move Zoho Mail to Trash, any Kiosk profile containing this app as a Kiosk-provisioned app, will have the Kiosk policy automatically disassociated from the devices. 2. If you have moved bulk purchased apps to Trash, it is recommended to remove it from the account as well. This feature is not supported in Apple VPP but supported in Play for Work. 3. Any apps moved to Trash, will not be automatically added back to the App Repository, on subsequent app syncing. App syncing is done only for those apps present in the App Repository.